Develop your Revenue Policies and Procedures Manual easily using editable Word templates. 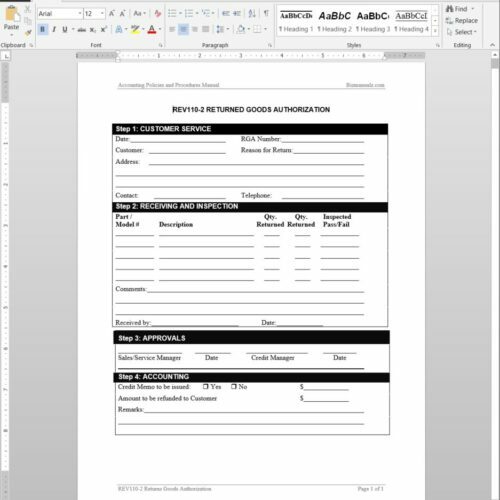 This downloadable product is also included in the Accounting Policies and Procedures Manual. This accounting procedures manual includes prewritten MS-WORD procedures with forms templates for any purchasing department. DOWNLOAD yours now. The proper identification and acceptance of all sales are an important element of internal control for a company’s income statement. It represents the primary source of most companies’ operational cash flow and therefore needs to be protected, managed and monitored using financial internal controls. The included revenue cycle accounting procedures should be utilized to account for and recognize all sales income of the company. Use these accounting revenue cycle procedures to ensure efficiency and success in your accounting department. This Revenue Policies and Procedures Manual was developed to assist organizations in preparing a Standard Operating Procedures (SOP) Manual for any industry or business size. It can be custom tailored to fit one’s individual company concerns and operations. Download Your Revenue Policies and Procedures Manual Now! Improve all aspects of your revenue policy & procedures, including sales order, shipment of good, customer returns, and more. 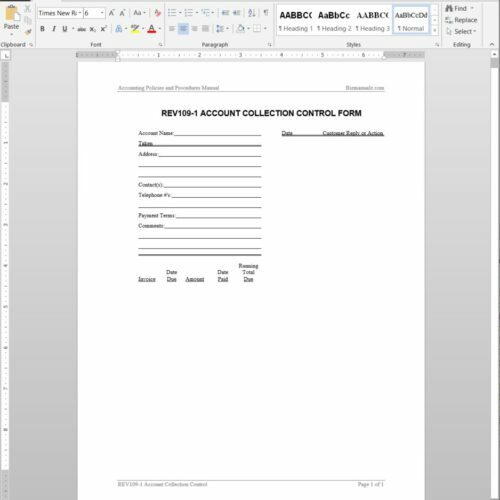 Save time using prewritten accounting procedures manual Word Templates. 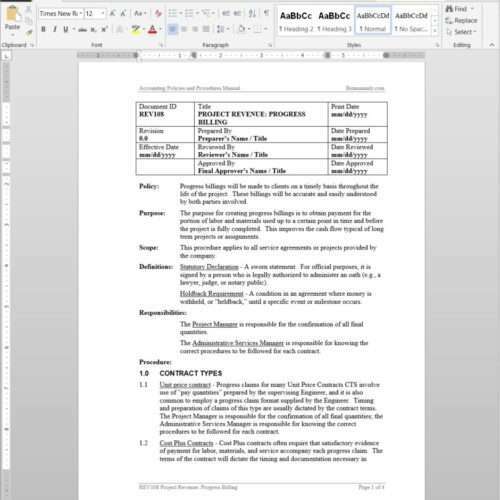 The Revenue Policies and Procedures Manual comes with 11 easy-to-edit Microsoft Word document template files, available as a convenient downloadable file. Take advantage of this special package and start saving yourself the time and money to develop this material. Download yours now!